This post first appeared at seattlepi.com in 2012. It’s been revised for reposting here. Now…imagine having that moment, that startling spark of revelation, that chill running up your spine that whispers, ” There are more things in heaven and earth, Horatio, Than are dreamt of in your philosophy!“, and having it not once every two or three years but…almost every day. It seems impossible that The Bruery has only been in business since 2008. It was a classic story: Patrick Rue, a young newlywed who was just entering law school, back in the early 00s, started innocently homebrewing, with the usual results: messy kitchen, aggravated wife, weird smells wafting across the neighbor’s patio. But in that spume of viciously-tweaked grain aromas a passion was born and yet another career path – and can any of us really claim that we think a career-fail as an attorney is a bad thing? – was summarily yanked askew by visions of crowds of happy beer lovers communing peacefully over beers like few of them have ever tasted. Patrick soon left law school behind and, amid shouts of “What, have you two lost your fu___ng minds?! ?“, The Bruery was born. “Beers like few of them have ever tasted“, to be precise, is what almost every young brewer thinks, when they’re dreaming of their own place and their own success. The catch is, damned few of them are skilled and creative – not to mention brave – enough to actually make beer that’s appreciably different from the other 3,700 other beer producers in the US. The vast majority of brewers struggle mightily, daily, and maybe, if they are very conscientious and persistent ( and lucky), come up with one or two beers in their careers that are distinctive enough to stick in peoples’ minds. Patrick Rue seems not to know how to make anything else. The twelve carefully-chosen bottles above are, with no exaggeration, a tiny fraction of the total number of beers that Rue & Crew have turned out in the company’s astounding 5 and a half year history. RateBeer’s “The Bruery” review list includes three hundred different brews and that’s not counting some that were brief, taproom-only offerings and were never rated. For the math-challenged, that sixty+ beers a year. Many breweries struggle to turn out half that (or a quarter that). It’s especially astonishing when you consider that Patrick Rue still, in the face of all that prolific output, considers his brewery relatively modest and under-equipped. An affable, quiet-spoken, uber-intelligent man with what some people would call a “baby face” (he’s probably going to be carded in liquor stores until he’s in his forties), Rue is a rather wonky scholar of brewing and beer styles, the breadth of which shows up tangibly in The Bruery’s devout Belgian leanings and in beers drawn directly from other, far more obscure, Euro brewing traditions. One of my favorites is the Rugbrød (second from the right, top row, abive), a Danish-styled Julebryg ale made with three different styles of rye malt. In an era when rye is really just being re-explored as a base grain for beers in the US, (the Europeans have been using it liberally for centuries) only Rue and Seattle’s Adam Robbings of Reuben’s Brews seem sufficiently adept at avoiding rye’s several potential pitfalls and/or cliches to allow them to use it in ways that manage to retain the delightful, chewy spiciness of it without having it dominate and skew the finished ale. Rue, in particular, seems to have a bottomless depth of inspiration, churning out new and innovative brews with a fantastic ease. He creates in beer the way Mozart created in music, and when I try some of the newer Bruery releases, I’m continually reminded of Mozart’s own words: “I make music as a sow piddles.” While I’m a definite advocate of keeping the sow analogy as far away from anything having to do with beverages as possible, it’s inarguable to me that Rue seems to make this near-impossible business of making eye-popping, soul-rattling ales look awfully easy, in a time when many, many young brewers are finding out the hard way how freakin’ difficult is actually is. 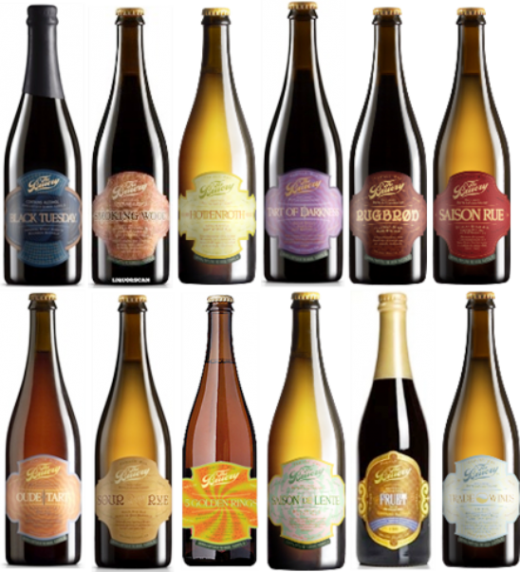 ← The 15 into 16 Bounty of Deschutes: Dissident, Hop Trip, Hop Henge, Red Chair, EHop, And MORE!